You’ve made the decision to run for office. You’ve registered as a candidate. How are you going to engage with your voters? Of course, social media plays a big part, but, not everyone is on Facebook or Twitter. You should definitely have a website to educate your voters, collect donations and to recruit volunteers. Shane Daley of Online Candidate gave us some great tips on what should be on your website. Shane and his partners have been designing websites for 14 years and have designed over 2,000 websites for political candidates. We had the honor of talking with Shane about his vast experience with regard to what works for candidate websites. Shane was kind enough to share five major tips on website elements for candidates. Starting to build an audience before you have a campaign website. Many successful candidates begin their online campaign long before they announce their intention to run for office. Social connections can help build relationships and get yourself better known. The earlier you start this, the more time you can use to build online support. Ultimately, those social followers will be the first to know about your campaign and be more likely support you with initial donations of time and money. Putting up a website and slapping on a donation button a few weeks before Election Day is not a winning tactic. It takes time and effort to build support. Starting a political campaign website as early as possible provides more time to raise campaign seed money. A website set up for early donations makes it easier for initial donors. Someone is more likely to quickly click and donate than to write out a check, put it in an envelope, and mail it out. Finally, Google does not tend to ‘rank’ new, unknown websites. To get a site to show on Google takes both time and the existence of links from other sites pointing to the website. If you want voters to find you through search engines, you need to take control over what exists about you online. Every campaign website needs a domain name. Most candidates use their name, often with a variant of ‘vote’ or ‘elect’, such as votejoesmith.com or electjoesmith.com. The .com extension is your best bet. Avoid using a year or position title in name if you plan to keep the domain throughout your political career. Unless your own campaign is high-profile or particularly contentious, it doesn’t make sense to register every available domain extension and variant. Think for the long term. Remember that you are renting your name from the registrar company for as many years as you pay for it. If you stop paying your domain registration fees, anyone else can step in, register that name and point it to another website. That happens often, sometimes with embarrassing results. Search engine optimization (SEO) is a way of building your website pages to make them more attractive to search engines and have them rank higher for related searches. A search engine cannot know what a web page is about if there isn’t enough relevant text on the page. We often see local campaign websites say ‘Candidate X for Mayor’, but don’t actually mention the state that the municipality is located in. If you are running for office in Montgomery, is that Montgomery, New York or Montgomery, Alabama? Don’t leave it to chance. 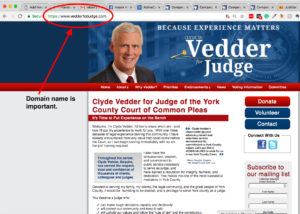 Some candidates like to write website copy in the first person. A search engine doesn’t know who “I” is. 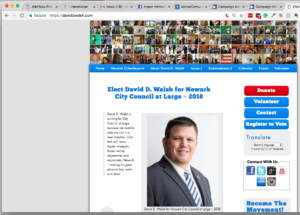 It’s better to write the website copy in third person and include the candidate’s full name. Running your online presence from a Facebook page is possible, but not everyone is on social media and not everyone wants to join. Putting up digital barriers only excludes voters and potential supporters. The campaign website is critical as a central place to reference in your online and offline advertising. A website lends credibility to a candidate or organization. Many people will not donate through a Facebook post or a Twitter link. 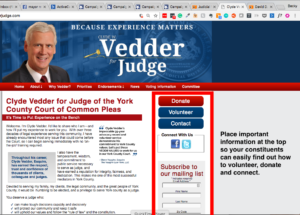 A campaign site provides a fixed place to send donors and provide information to supporters and voters. A few other key points with regard to your campaign website is to start early. 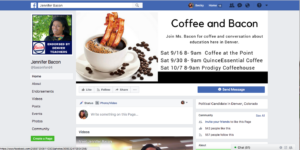 Candidates now start about a year prior to their campaign, remember, it takes time for SEO to work and it gives you time to recruit supporters and endorsements. Make sure your website is responsive. A responsive website will automatically size to the screen size. For example, your website will automatically scale to a smart phone, tablet or website, which is what you want. Keep your website after your campaign is over and your domain. Domain’s are about $12/year so a $1/month is worth keeping your domain name. Getting your message out to your voters is key and having a website is a very effective tool in campaigning, without it, your constituents won’t have a place to get informed about your message, donate or volunteer in one central place. Shane Daley is a partner of Daley Professional Web Solutions and Online Candidate. He has over 15 years of experience as a web developer, with a focus on search engine optimization and online marketing. Online Candidate provides political candidates and organization with affordable campaign website packages. The platform, built-in tools and resources helps hundreds of candidates every election cycle. Schedule your live Handrasier demo today to see how we can help you win your election.